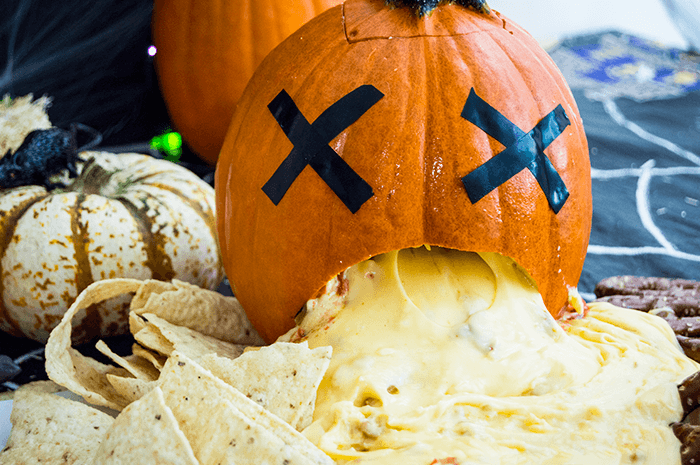 Gross out your trick or treaters with these disgustingly delicious pumpkin puke nachos. 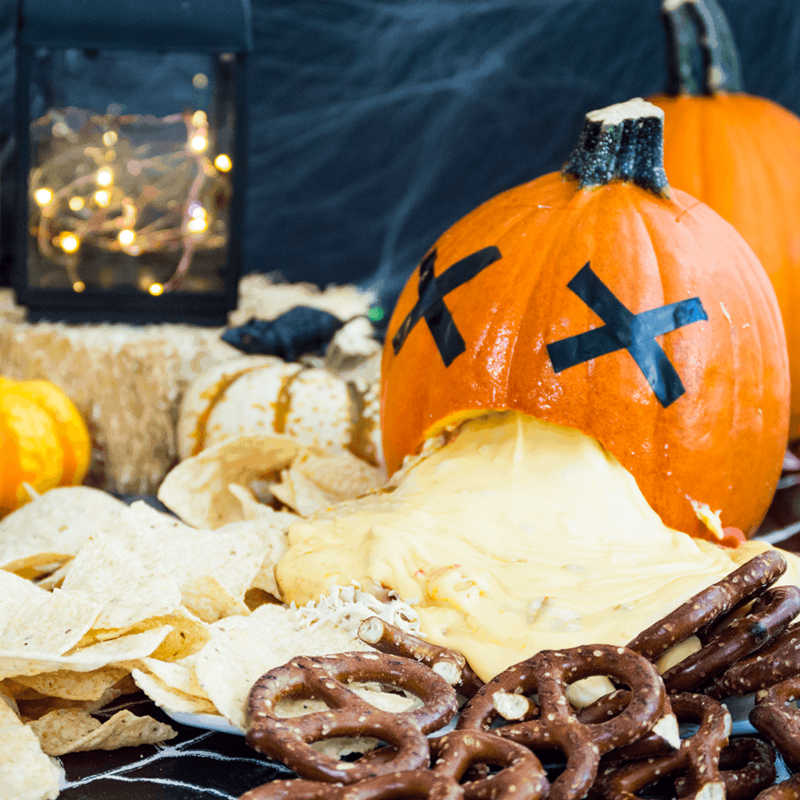 Using a real pumpkin helps keep the nacho cheese warm as it spills out the mouth of the pumpkin onto a pile of shredded chicken and tortilla chips. The slow oozing of the cheese puke creates a nice effect, making it seem like the pumpkin is endlessly emptying it's stomach contents. The secret to the perfect nacho cheese consistency, especially one that needs to ooze and flow freely, is to use processed American cheese plus a little bit of mozzarella. Just start with a simple roux and add the cheeses until they are nice and melty, then combine with sauteed veggies or your salsa of choice. Keep the cheese warm until you are ready to gross out your guests with the disgusting puking display. Fill the pumpkin to the top to keep the cheese oozing throughout the evening. Cut open the top of the pumpkin. Use a spoon or fork to scrape down the insides of the pumpkin to remove the seeds and stringy bits. Use a sharp knife to remove some of the excess flesh from around the opening, taking care not to cut the opening wider than the "lid" of the pumpkin. Carve a "mouth" hole into the front of the pumpkin. Set aside. In a skillet over medium high heat, add two tablespoons of butter and saute the onions and peppers. Stir in the tomatoes and cook for about five minutes, or until most of the juices have evaporated. Season with salt and pepper. Scrape the softened veggies into a separate bowl and wipe the skillet clean. Make a simple roux by adding the remaining half cup of butter to the skillet. When it has nearly completely melted, add the flour all at once. Stir until the flour is golden, then pour in about a quarter cup of heavy cream and stir until smooth. Pour in the remaining heavy cream and stir until completely combined. Place the cheeses into the roux and then pour in the milk. Let simmer for a minute or two to soften the cheese, then stir constantly until the cheeses are completely melted and mixed together - about 10-15 minutes. Keep the cheese warm or in a microwavable container until ready to serve. Add the cooked veggies onto the top of the cheese. When ready to serve, arrange a plate with shredded chicken, tortilla chips, pretzels (whatever you wanna dip!) and place the pumpkin in the center. Slowly pour the melted cheese into the top of the pumpkin and watch as it oozes out it's mouth. Place the "lid" back on the pumpkin to help keep the cheese warm and gooey. Have a happy Halloween!